The relationship between disability and poverty has been acknowledged with reasonable conviction in recent years. Various commentators have expressed how disability and poverty are bound together, one feeding into the other, a relationship typically presented as a mutually reinforcing cycle (World Health Organization and World Bank 2011). Within this discourse, sometimes supported by schematic representations, it is said that poverty exacerbates and/or intensifies impairment or vulnerability to it, while the barriers encountered by disabled people result in a greater chance of falling into or experiencing more intense poverty. As a result, disabled people are said to be among the poorest of the poor. The argument that impoverishment is what typifies many of these disabled lives, supports the efforts of those who insist that disability is not only relevant to, but cuts across international development policy, research and practice. This has come to be known as disability mainstreaming (see Chap. 1 in this volume, Grech 2016). The emphasis on the disability/poverty relationship has remained a strong linchpin in negotiations with the United Nations to get disability into the coveted Sustainable Development Goals (SDGs) and now forms a key discursive component in the new rhetoric on ‘disability-inclusive development’. CBM. (n.d.). The twin-track approach. Retrieved from http://www.cbm.org/The-Twin-Track-approach-250816.php. Accessed 6 Nov 2015. Soldatic, K., & Grech, S. (2014). 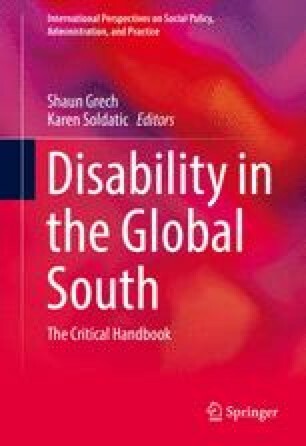 Transnationalising disability studies: Rights, justice and impairment. Disability Studies Quarterly, 34(2). Retrieved from http://dsq-sds.org/article/view/4249. Accessed 7 Dec 2015.